Summer is starting to set in and if your wedding date falls bang in the middle of the season the mood is sure to be light and summery too. Your outfit colors, the centerpieces on the tables and the entire décor will be carefully chosen to reflect the joyous summer sunshine. 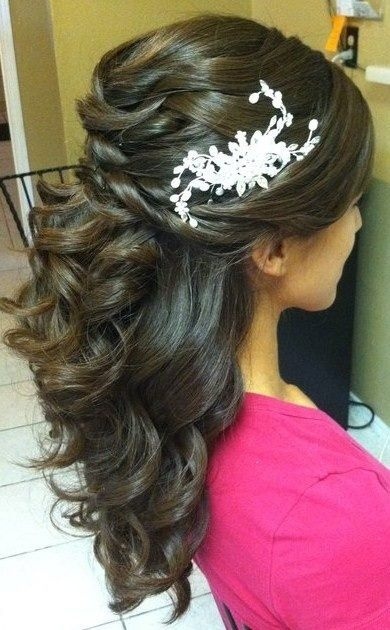 So how about a little bit of inspiration for your hairdo as well? Take your pick from these stylish hairstyles that are gorgeous to look at and also an ideal solution to beat the heat. 1. Say it with flowers: The best way to bring out the feeling of summer is to deck up your hair with beautiful flowers. Whether you delicately place them along your braid or weave them into an updo, it is sure to look fantastic. Pick flowers that are in a similar color palette with your outfit and ask your hair stylist to work the magic. If you aren’t sure which colors to go for, whites, yellows, and pale pinks are wonderful options for this season. 2. Knots and braids: A simple trick you can try to keep yourself from getting all hot and bothered on your wedding day is to style your hair in modern style braids and updos. With a variety of new techniques available you can opt for a more elaborate fishtail braid or even a braided bun to keep the hair of your neck and feel comfortable all day long. 3. Embellishments: Studded hair clips, embellished barrettes and hair pins not only look gorgeous but also double up as a convenient hair accessory to stop your hair from getting in the way. There are so many embellishments available that you will be spoilt for choice when it comes to picking one. So why stop there? Pick up a bunch of hair accessories that will glamorize your hair do in moments and add a little bit of sparkle and bling to your stylish summer wedding. 4. Head gears: As the mercury level rises you can keep your crown looking cool with a fashionable head gear. You can choose a delicate and elegant thin strand head gear or opt for a bold and dramatic tribal style head gear. Either way, your groom and your guests will not be able to keep their eyes off you.